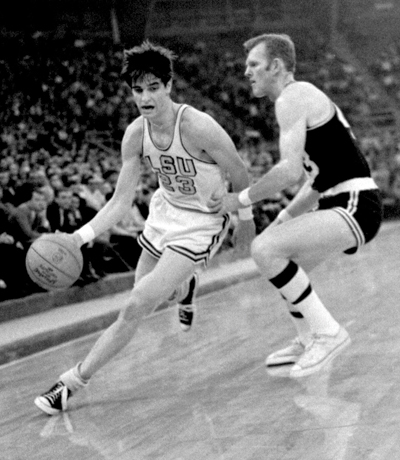 One of my most vivid memories as a journalism student at LSU in the late 1960s is the time I spent photographing the incredibly talented basketball player Pete Maravich in action. I worked for The Reveille, the campus newspaper, and I’d sit right behind the basketball goal and shoot pictures of this skinny, mop-haired, floppy-socked guy who must have been the best ball-handler in the history of the game. Some of the things he did with the basketball – behind-the-back and through-the-legs passes, for instance – were sensational. He really put on a show. Sportswriters couldn’t believe their eyes, nor could the people in the stands. Pistol Pete was a superstar. He was on top of the world and seemed very happy with his lot in life. But despite all outward appearances, despite all the fame and adulation heaped upon him, Pete Maravich was a very troubled young man, as he would reveal later in life. At the time, he was well on his way to becoming the highest scorer in college basketball history. He was an All-American. He had scored 69 points in one game against Alabama. He always played to a sold-out house; the fans came to see him, and he knew it. After college Pete would move on to play in the pros, signing up with the Atlanta Hawks in the most lucrative contract in sports history at the time: $1.9 million. Then he played for the New Orleans Jazz and the Boston Celtics. He was All-NBA. He was not only very talented but now he was very rich, too. But all that didn’t make him happy. He felt an emptiness inside; something was missing in his life. He felt unfulfilled, incomplete. Pete thrashed about for years trying to fill that void within. He tried to drown his worries in alcohol, but that didn’t work. He delved into Eastern religious philosophies. He dabbled in various nutritional practices, including vegetarianism and prolonged fasting as he sought enlightenment and clarity about his purpose in life. But mostly he came up empty. The feeling of being incomplete remained. He seriously considered suicide on more than one occasion. Pete eventually did find fulfillment and peace of mind. He explained the turnaround one night in a pre-game talk he gave to the LSU basketball team. Coach Dale Brown had invited Pete to address the team, hoping he’d inspire and motivate them to give their best effort ever in this important game. Pete began by rattling off his accomplishments: All-American, All-NBA, top scorer ever in college basketball, lucrative contract with the Atlanta Hawks, owner of expensive homes in Metairie and Atlanta, on the cover of Sports Illustrated several times, etc. Then he paused and lowered his voice, and his demeanor changed. “Four o’clock in the morning, sitting on the bed in one of the rooms in our house, I was just going to put the pistol in my mouth. I was so down in the dumps. For some reason I set the pistol down on the bed. I didn’t know how to pray. I didn’t even know if there was a God. But I fell on the bed, prone, face down. And I said, ‘God, if there is a God, I don’t even know if you are there … But, God, if you’re there, would you somehow, in some way, please touch my life. “Instantly – I don’t know how to express it – the sun didn’t dance in the sky, the sea didn’t part, but a peace took over my body, for the first time in my life. Before that moment, I had been a miserable S.O.B., until I took God into my life four years ago. “Guys, whatever you do, do not let your possessions possess you, or you will end up miserable, as I did,” Pete concluded. Pete not only accepted God as his creator but he also embraced Jesus Christ as his savior. He was on fire with enthusiasm for his newfound religious beliefs. He wanted to tell the world how he finally, finally found peace, happiness and fulfillment. He became a Christian evangelist, telling his story countless times, in a wide variety of venues from prisons and gymnasiums to the Billy Graham Crusade events. He’d speak to anyone who’d listen. But his time on the speaking circuit was cut short by his untimely death at age 40, a year or so after he addressed the LSU team. He was in Pasadena, California, playing a friendly game of 3-on-3 basketball when his heart failed. Unbeknown to him or his doctors, he had a congenital heart defect. Pistol Pete’s life story is recounted in several books, including two by Baton Rouge residents who knew him well: Getting Over the 4 Hurdles of Life, by Coach Dale Brown, and Tiger Beat, by veteran sportswriter Sam King. Both are available at www.acadianhouse.com. Pete’s testimony during a Billy Graham Crusade is accessible on YouTube.